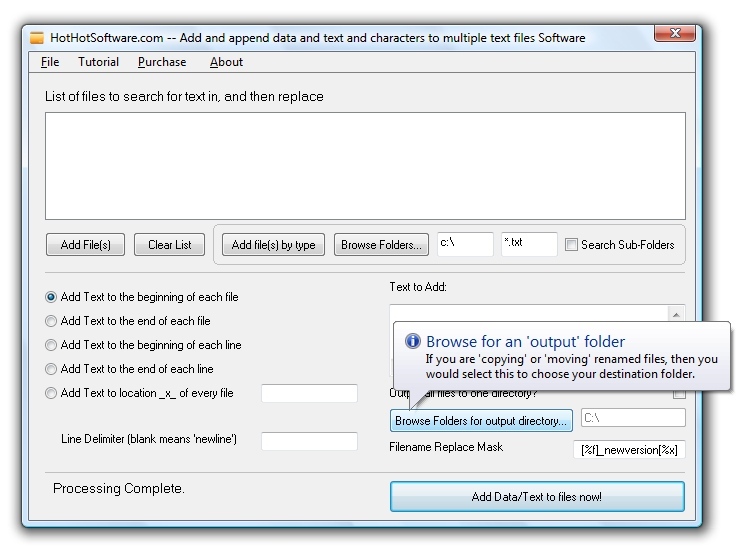 Add and append data and text and characters to multiple text files Software! Get it now! Only $29.95 U.S. (Regular $49.95 US!) for a limited time! 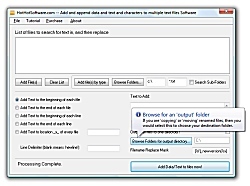 Easily add data or text to multiple text files all at once! Easily select a number of files from any number of directories, and apply your changes all at once! Extreme customization options! You can choose to add data or text to multiple files at the beginning, end or in the middle of documents, you can choose to add text at various character locations, or you can even choose to add it every line, with your own custom line delimiter! Easily add headers and footers, and other important text information! Good for copywriting documents! You can easily add legal agreements to any number of text documents, such as confidentiality agreements, or legal disclaimers, or you can even use it as a form of 'copy' protection in your written work! Plus much more! Try out this software now! Download this software now, and learn how you can start easily adding text or data to various text files all at once in bulk, now!